There’s been a lot of talk about Sourcing which requires one to explore untapped avenues to scout the needle in the haystack Talent that aren’t being Sourced. We’ve spoken about different trends in Sourcing Talent for instance Executive and Non – Executive Search Sourcing Techniques and methods on a general level. 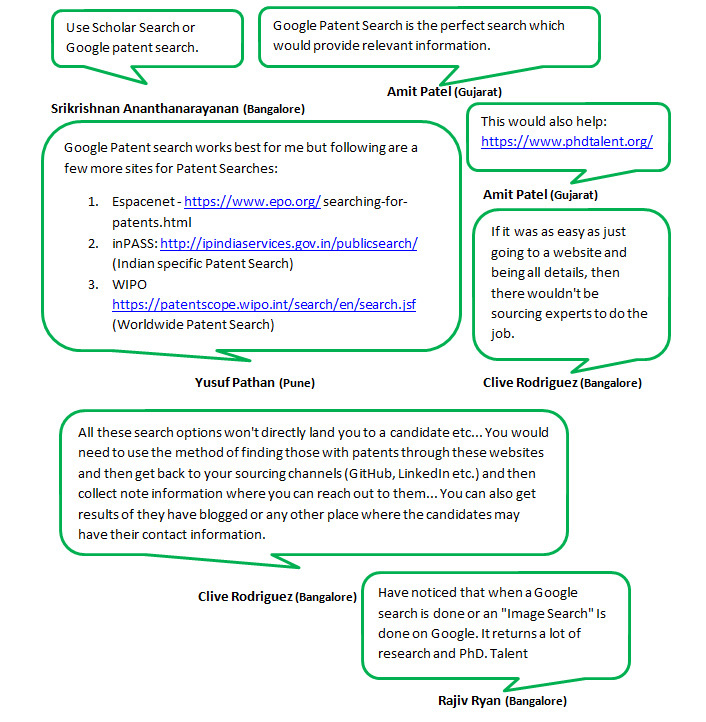 But have you focussed more on the ways and means for Sourcing specific Talents? Well this brings us to the end of yet another insightful WhatsApp discussion like the other one we had about, “Is Counselling Candidates on improving their Job Hunt Strategy a Recruiters Role?” If you read this far then we’re sure that you’ve something interesting and worthwhile. And if you’re not yet a part of these enlightening conversations then you know from the discussion above what you’re missing out on. There you have it; now wasn’t that easy that too in just 1 step besides you’re already a part of the Sourcing ADDA family if your reading this. Then why not make it official and add to your learning in a fun and exciting way while interacting with like – minded individuals like yourself. There’s been a lot of talk about Pre & Post Engagement of applicants, we’ve even heard a lot about pre & post joining goodies. But have you ever thought about other areas where we can implement the Engagement of applicants? If no, then you’ve come to the right place; we’ll be exploring the areas where we can utilise this technique to improve the joining ratio of candidates shortly. Post offer engagement is one of the important aspects to keep the candidate warm & enthusiastic to join the company. Have a regular dialogue with them to know the status of the candidate with regular interactions and share key highlights with them. Senior folks can have a discussion or dinner or lunch with the new Joinees as it creates a very good impression in a candidate’s mind. Have discussions with Candidates to find out about their interest level, family issues if any, comfort level post the offer, expectation and the kind of training they’ll need. Keep Candidates engage by calling them regularly and check their progress simultaneously and even conducting a Candidate survey also helps. During office parties if there are any Candidates that have accepted an offer & will be joining soon invite them for the parties or dinners. Inviting them for a team lunch or outings to make them feel comfortable with the team and the managers to help them get to know people they’ll be working with. Try to ensure that there are amazing talents in the team to boost their interests and increase the chances of them joining the firm. Send welcome emails with on-boarding training courses and keep them in the loop of things that involves them while sharing with them their schedule for Day 1 will help build his interest. Get Candidates to interact with other departments for instance the delivery team will make them feel warm and accepted. Invite PJ for a get together session where the leader ship team can give insight to them about to the company, its financial growth etc. followed with Lunch but be sure to make it more of an interactive session. 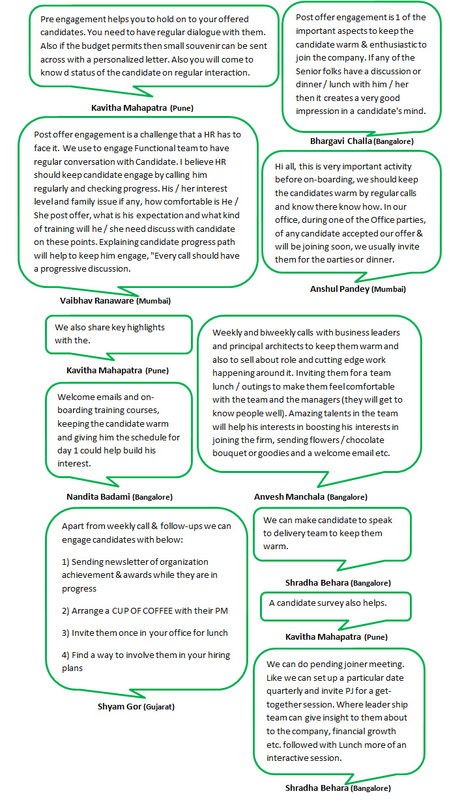 Now wouldn’t you agree that we’ve received great perspectives and ideas to conduct successful Pre – Engagement before On – Boarding Candidates. If you’ve found these inputs worth your while and you’re not yet a part of these popular WhatsApp group chat discussions then you don’t know you’re you’re missing out on. But now you do have a rough idea as to what you’re missing; for instance we’ve had a discussion on, “Employee Promotion Processes followed by Organisations” then you might want to be a part of these discussions. If you’ve liked what you’ve already read and would like to learn more than our WhatsApp group chats are exactly what you’ve been looking for. So be sure to follow us @SourcingAdda for real time updates to our upcoming events and activities. Ensure you leave your comments or requests to join these groups in our comments section, Tweet us or send us a DM to @SourcingAdda with your contact details and our representative will get back to you instantly. WhatsApp Group Chat – How Important is work location in terms of Hiring? Talent Acquisitionists are always Sourcing for the needle in the haystack and there have been several occasions wherein the applicant has turned down the opportunity due to commuting concerns. As a result closing the desired Talent has proved to be difficult. Having said that, @SourcingAdda we’ve taken the initiative to try and understand the importance of work location in terms of hiring. 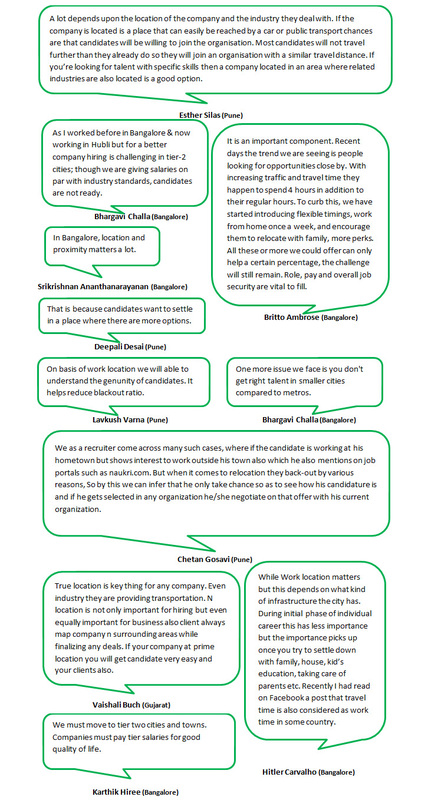 Thanks to our Bangalore WhatsApp group member Shashank’s; discussion topic suggestion, “How Important is work location in terms of Hiring?” So add to your learning with the discussion and ensure you remember the key take away points highlighted after. If Sourcing for talent with specific skills then a company located in an area where related industries are also located is a good option. There have been scenarios where the candidate works from home yet is interested in working outside his town and is also mentioned in the résumés on job portals. But the importance picks up once they settle down with the family, house, kid’s education, taking care of parents etc. On basis of work location we will able to understand the genuinely of candidates. It helps reduce blackout ratio. On the basis of the work location we can understand the genunity of candidates and it helps reduce blackout ratio. To deal with the challenge of relocation we need to check their candidature and if selected in any organization he / she can negotiate on that offer with the current organization. Companies must pay tier salaries for good quality of life and to capture and retain the right calibre Talent. Now that’s one heck of a discussion, wouldn’t you agree? Once again we’ve received an out pour of responses with a lot of inputs to add to our learning as well as yours. If you’d like to get real time updates to our upcoming activities and events be sure to follow us @SourcingAdda. If you’ve found the discussion enlightening and would like to be a part of these discussions then please share your WhatsApp contact no & you’re location via DM (Direct Message on Twitter) or leave your requests to be added in the comments section along with your views. We’ve heard a lot about Gamification done to boost Talent Acquisitionist’s performance, how it can improve the KRAs and case studies where the results were positive and in keeping with the assumptions. While we’re impressed by the results and progress we’ve received due to Gamification. Have you thought of other possibilities where Gamification could be implemented to boost performance? If you haven’t thought about it yet then let’s start with examples where Gamification can be implemented; for instance in other areas of a Recruiter’s profile or to boost employee performance. As always we’re one step ahead of you thanks to our WhatsApp group members. 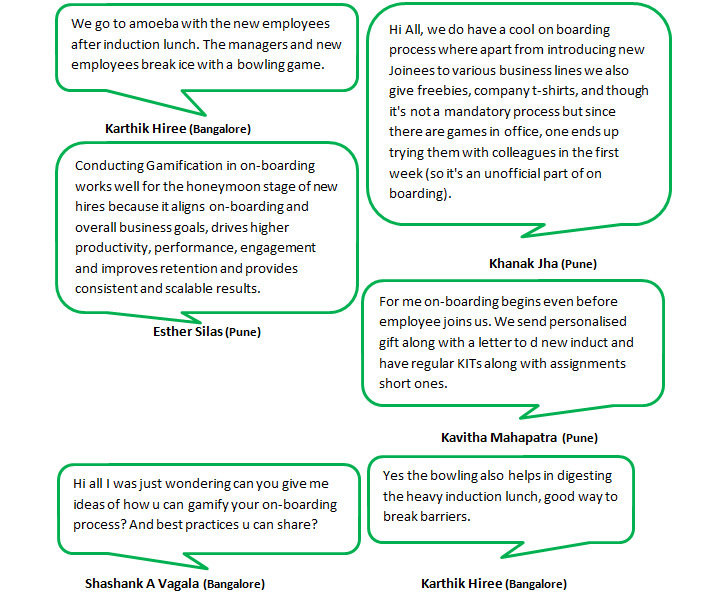 We @SourcingAdda conduct weekly discussions every Wednesday where we had a discussion on, “Gamification in On-boarding” upon the suggestion of our Pune group member Kavitha. There you have it the discussion that went by which had some interesting insights that you’d like to know and add to your knowledge. We’ve got some ideas on conducting Gamification in on – boarding, including Gamification benefits and perspectives too. You can go to Amoeba with the new employees after the induction lunch which enables Managers and New Employees to break the ice with a bowling game. Apart from introducing New Joinees to various business lines you can distribute freebies such as company t-shirts or conduct games in the first week of joining in the office for newbies to interact in an unofficial part of on-boarding. Send personalised gifts along with a letter to the new induct and have regular KITs along with short assignments. It aligns on-boarding and overall business goals, drives higher productivity, performance, engagement and improves retention while providing consistent and scalable results. Well this brings the insightful discussion to an end with lots of pointers to take away as always. If you’re no yet a part of these enlightening discussions then you’ve no idea what you’re missing out on. So if you haven’t joined these WhatsApp groups than be sure to follow us @SourcingAdda for updates to our upcoming events and activities. If you’d like to become a part of these WhatsApp groups then make sure you leave your views or requests to join them in our comments section else send us a DM to @SourcingAdda.